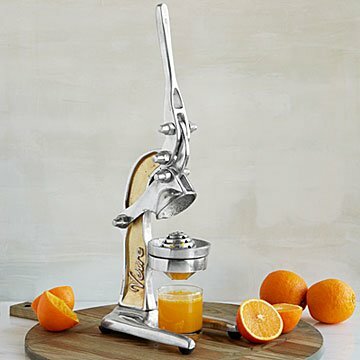 Made of recycled aluminum cans, this retro-style citrus juicer makes extracting every drop an easy task. Keep this swell-looking retro juicer on your counter, and have fresh-squeezed citrus juice any time you want. Made from recycled aluminum cans, it's the authentic style found in markets all over Central America. It efficiently extracts every drop of juice, while the strainer catches seeds and pulp. Simple to operate, most of its force comes from the juicer's "jaws," not you, so it's easy on your hands and wrists. Cleaning is easy, too. Super sturdy, it'll provide delicious juices for drinking, cooking, and cocktails for decades. The standard (in copper) is best for limes, lemons, and small oranges; the XL (in rose gold) for oranges and grapefruits. Designed by Jacquie Lewis and Jules Vertrees . Handmade in Mexico. Wash well with soap and water, and dry with soft cloth before first use. Fruit-holder portion can be removed for more effective cleaning. In the summer, we make delicious "Orange Crushes" with vodka, Cointreau, sparkling water, and of course fresh squeezed orange juice. The fresh squeezed juice makes the drink taste amazingly good. The juicer sits like a decorative piece of jewelry on our counter top. Always ready to use and easy to clean. For the price, I was expecting an juicer that was easy to use. This one takes more effort than I was expecting. It is not steady on my counter. Materials seem sub par. Left Silver flecks of paint in the juice. We washed this juicer prior to use and after juicing 3 oranges we saw silver paint left on the oranipeels which prompted us to look closer at the juice and found silver flecks floating along with a silver film in the top of the juice. I will be returning this juicer. We used it again and the same thing happened. Would recommend it for anyone. Looks great at the bar and is easy to use! We received lots of complients. Bought this as a Christmas present, they absolutely loved it. It's just pretty sitting on the counter. Love the retro look and diy functionality. I can have fresh juice anytime, and I can be certain there are no additives. You need some elbow grease and patience (can't expect a 10-second glass of juice), but it's worth it..
Wash it at least 10 times before using!